The eagle-eyed among you may have already noticed a new item appearing in the Profile tab of the User record: Kiosk Pin. We are working on a new enhancement of our tablet mobile app that will allow it to be set to “kiosk” mode allowing multiple users to log in to the mobile via a Pin, and record their timesheet record. You can mount an iOS or Android tablet in a convenient location to support this kiosk mode of data sharing. We’ll update you on this development when we release a new version of our tablet app in the near future. Similarly, we are preparing for new app integration options using an API key that can be set via a new Settings menu option, Integration. Again, we’ll document this important new feature in more detail shortly. We’ve made some changes to the User > Security panel to clarify and rationalise Screen security vs Rights security. You can specify whether users are to have access to view and edit cost and bill rate. Certain security settings are automatically set for Administration users. We suggest that you review these security settings for your existing users in case these changes impacts on the access rights that you are now able to specify. You might have also noticed that we’ve added the option to specify that a timesheet user is a Contractor in the Admin > User > Profile panel. This enables you to filter by Contractor user in the Admin > Timesheet Export screen. This means that you can filter and select all Contractors and then select the Process – No Export option to mark their timesheet records as having been “processed” for payroll purposes. Typically, you will prepare an Enquiry report for these Contractors to assist with invoice reconciliation against their timesheet records. 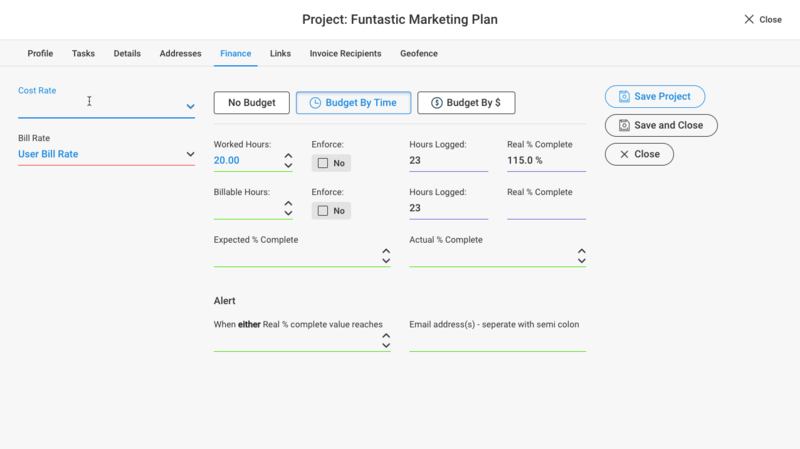 We’ve improved the layout of the Project and Task Budget panels (Admin > Project > Finance) to clarify the meaning and logic that applied to these settings. We’ve also improved the layout of the Invoice > WIP screen and also implemented a pulldown Settings and Actions menu to specify what is to be displayed in the WIP screen. As is always that case, we’ve made lots of smaller “quality of life” improvements and fixed a number of bugs that we’ve found and our users have reported. Keep sending us your suggestions for improvement. We continue to get great feedback from our users that they appreciate our ongoing improvement to TimeSite Pro. Please refer to our Knowledge Base formore information on these enhancements as well as other TimeSite Pro features.